Miss Charanjit Kaur resides in Jandiala Manjki village which is located in Jalandhar (Punjab). There are five members in her family. Her Father is a daily wage labourer and the only earning member in her family. Her economic condition was not too good. So she could not able to join any institution for any professional degree in Beauty and Wellness. During mobilization, mobelizers met her and inform her about the free three months skill training program provided by Don Bosco Tech in Jalandhar and also informed her about the benefits of doing course with Don Bosco Tech and suggested her for beautician course.During her training period, she learnt each and everything very attentively. She is very hard working. 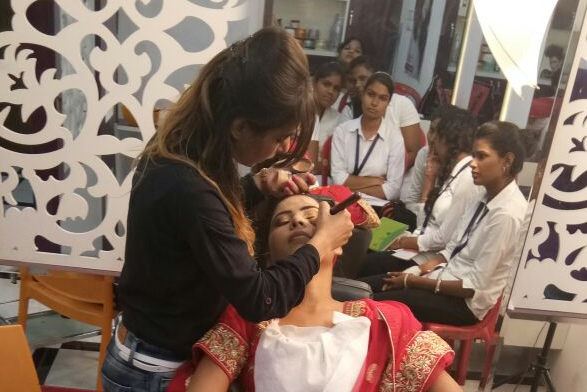 After the training, Don Bosco Tech provides her chance to be interviewed in Great Clip Salon, where she was performing well and getting salary Rs 5000/- per month. Now she is very happy with the job as a Beautician and supporting her family financially. Also she is thankful to Don Bosco Tech who helped her in building her career.